In Map, Chart and Treemap views, Tinderbox uses a 'dog-ear' (like the folded page corner) to denote the presence of content; Outline view uses a different method, with content-related variable note icons. The dog-ear is not interactive, it simply indicates that a note has content. 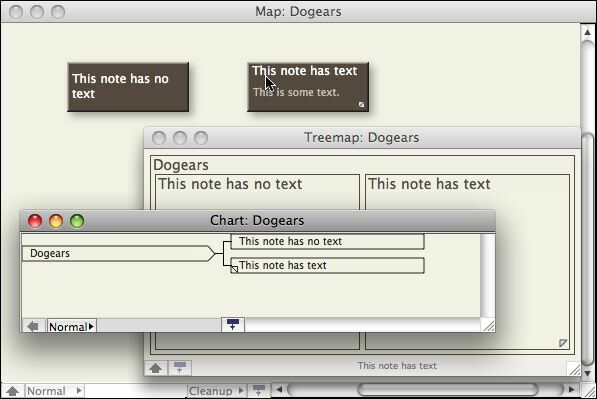 In Map and Treemap views, the dog-ear is bottom right of the note icon, in Charts it is at bottom left of the note icon. The background color of the dog-ears is the same variable color used for outline icons to indicates the age of the note (since last edit). Originally, the background color of the dog-ear was the view's background color.